Bangladesh is the second largest apparel exporter in the world, right after China. The net apparel export revenue has reached USD 30.61 billion as of 2018 and it accounts for 83.49 % of the total exports of the country (source: Embassy of Bangladesh). The sector alone contributes about 11% -12% to the GDP and employs more than 4 million people, mostly women, at approximately 4,560 garment factories (as of 2018), who are playing their role as a major driving force of the country’s economy. Some of the big fashion brands manufactured in Bangladesh are: Marks & Spencer (UK), Calvin Klein (US), Lee (US), H&M (Sweden), Supreme (US), Zara (Spain), American Eagle (US), Armani Exchange (Italy), Tommy Hilfiger (US) and Hugo Boss (Germany). The main reason for the big brands to have their manufacturing base in Bangladesh is because the country offers competitive labor and lower conversion costs than other RMG manufacturing countries such as China with the best quality guaranteed. In addition, Bangladesh has the highest number of green RMG (Ready Made Garment) factories in the world: 67 eco-friendly green factories followed by 40 in Indonesia, 30 in India and 10 in Sri Lanka. 'Competitive labor cost' as well as fiscal and monetary incentive offered by the Government of Bangladesh like 'Cash incentive', 'Bonded warehouse facilities' and 'GSP facilities' offered by EU help to flourish the RMG sector. Recently, Bangladeshi RMG factory’s capability to follow the compliance aspect has attracted the top class buying houses of the world. Bangladeshi RMG factories are fully capable to produce any kind of apparel (any design using any fabric material) within the time frame ordered by the buyers. Interestingly, South Korea is the largest source of FDI in the textile and garments sector of Bangladesh. According to the Bangladesh Bank, the countries textile and apparel sector received USD 421.68 million foreign investments in 2017 with South Korea as the largest investor (USD 103 million) followed by Hong Kong (USD 66.13 million) and the UK (USD 42 million). Tofail Ahmed, Bangladesh former Commerce Minister, at a meeting in 2017 with Ahn Seong-doo, the former South Korean Ambassador to Dhaka, said that there were more than 200 South Korean businesses investing in garment and other sectors in Bangladesh; if the Korean investors set up production units in the SEZs (Bangladesh Economic Zones), they would get all the facilities from the Government alongside duty-free market access for their products in the global market under the WTO rules (source: Apparel Resources/ South Korean Embassy to Dhaka). Among those 200 companies, Youngone Corporation (a Korean multinational apparel and sportswear manufacturer having its headquarter in Seoul with production facilities in Bangladesh, Vietnam, China and El Salvador) is leading the field by hiring around 65,000 local employees in Bangladesh alone as of 2018; Hyundai and POSCO Daewoo are also engaged in construction, while Samsung, LG and SK are also engaged in the fields of their interests, according to H.E. 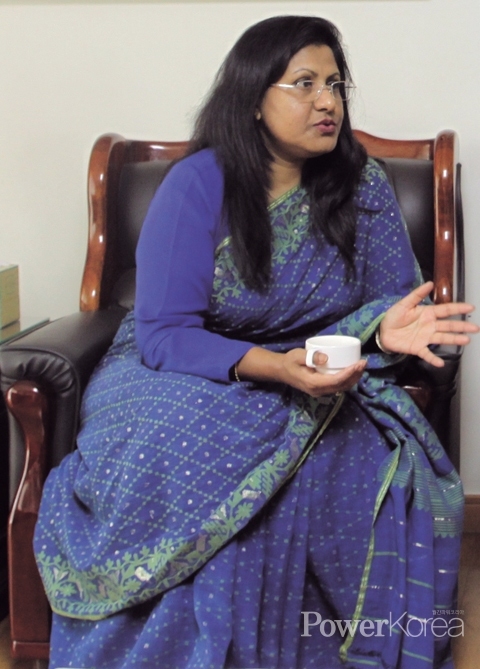 Abida Islam, Ambassador of Bangladesh to Seoul. “However, South Korea not only shows strong presence in the textile and apparel sector but also showing interest in various sectors such as cosmetics, medical equipment and assembling plants as well as finance; Woori Bank is running 5 branches in Bangladesh” added Abida Islam. The Film Festival, organized by the Embassy in association with the Korean Culture Association (KCA) marked the 3rd round last year and it is to showcase quality films (Haldaa, No Bed of Roses, The Cage, Swapnajaal in 2018) directed by eminent film makers of Bangladesh. Itaewon is the multi-cultural and multi-ethnic area in Seoul and the Embassy displays traditional crafts in its booth during the Itaewon Global Festival; the embassy adds traditional food during the Seoul Friendship Fair, another large scale multicultural festival in Seoul. Bangladesh was selected as the ‘County of Honour’ in the 2017 Migrants Arirang Multicultural Festival and was placed first in the rally competition during the event. Other notable events and engagements of the embassy are the Bangla New Year in Seoul which accompanies colorful rally and beautiful Bangla dance, Language Martyr’s Day of Bangladesh and International Mother Language Day, the investment seminars which highlight the trade and economic potentials of Bangladesh, the Import Goods Fair (IGF) to promote Bangladeshi goods such as ceramic ware, leather, jute and home textile products, and the participation in the Korea World Travel Fair (KOTFA) to find ways to attract Korean tourists to the beautiful landscapes, rich culture and heritages of Bangladesh. It is the longest unbroken sandy sea beach in the world located at the south-eastern part of Bangladesh; the most famous tourist destination of Bangladesh. Besides the resplendent beach, it offers such attractions as ornamented temples and pagodas and a view of indigenous communities and their vibrant culture. It is located in the Southern part of Bangladesh which is 18 kilometers (11 miles) long. The sea beach is a rare beauty spot at the southernmost tip of Patuakhali district. It has a wide sandy beach which affords visitors the unique opportunity of watching the breathtaking sunrise and sunset. Kuakata is a place of pilgrimage for the Hindu and Buddhist Communities. Many devotees arrive here during the festival of Rush Purnima and Maghi Purnima. A visit to Bangladesh would remain incomplete if the ‘Sundarbans’ did not appear in the itinerary. It is the largest mangrove forest in the world, criss-crossed by creeks and canals creeping around thousands of islets that swell and sink with the tide in the Bay. It is home to 80% of reptiles, 40% of mammals’ species and about 50% of all bird species found in Bangladesh. If someone is lucky, he or she will have the chance to meet the “Royal Bengal Tigers” here. Sonargaon meaning City of Gold used to be an ancient and historic city of Bangladesh from the 13th century. It used to be the administrative, commercial and maritime center in Bengal. Youngone Corporation of Republic of Korea has recently renovated the “Boro Sardar Bari” at Panam City of Sonargaon and now is working for the renovation of another historical site in the same city. There is no direct air connectivity from Incheon to Dhaka yet but now you can reach via one or more stopover which takes around 8 hours at the shortest route.